Who doesn’t enjoy a free day in the mountains? But I-70 can be brutal. 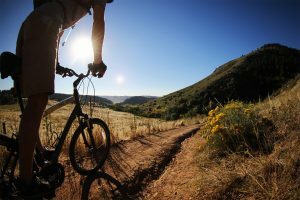 So get out of the car and instead spend your time hiking, biking, shopping, and sipping in Denver’s closest mountain town – Golden. Located only 12 miles from downtown Denver, Golden is where the plains meet the mountains. Sitting in spectacular Clear Creek valley, Golden is surrounded by foothills and buttes that offer year-round recreation. 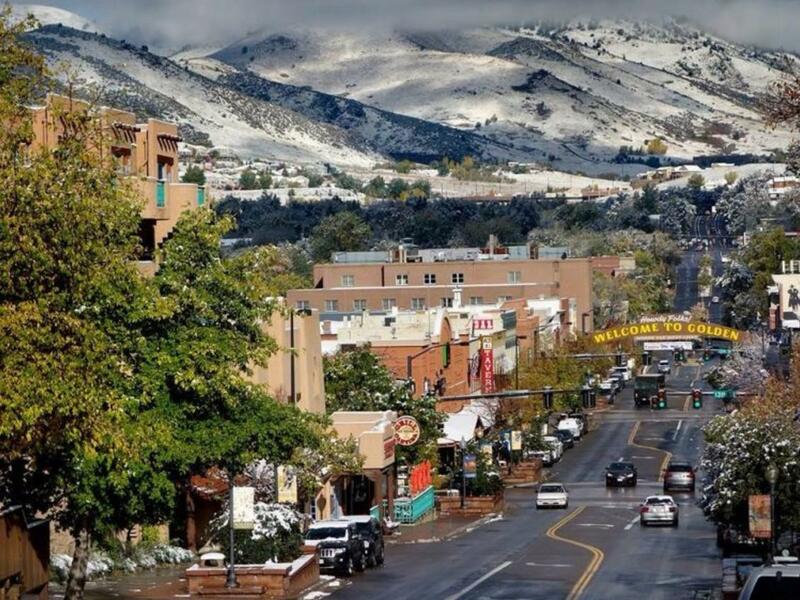 And at their base, pretty and historic downtown Golden is at heart a mountain town, filled with breweries, fine dining, coffee shops, art galleries, museums and locally owned shops. Here’s 10 ways to forget the long drive and enjoy the best of Colorado in Denver’s backyard. Pedal Up Lookout Mountain. Arguably the No. 1 hill climb in Colorado, the 4.3 mile, 1,300-foot climb from downtown Golden to the 7,379-foot summit was featured twice in the U.S. Pro Challenge. With 5-6 percent grades, it’s a tough hill, but bikers are rewarded with constant views of the mountains and plains. Stop in the snack bar at Buffalo Bill Grave & Museum on top before zooming down. Hike, Bike or Gold Pan on Clear Creek. The paved, off-street Clear Creek Trail stretches from the foothills just west of Golden for 19 miles to the South Platte River and Denver. It’s one of the prettiest rivers in Colorado. Right in Golden, you can bike, hike or stroll along the tree-shaded path, or even pan for gold in a stream that has yielded millions of dollars of it. Enjoy Craft Beer & Friendly Conversation. Charlie and Janine Sturdavant opened Golden City Brewery in their house in 1993, and the outdoor beer garden is still their backyard. Order a beer through the Dutch door in their garage, and relax by the outdoor fire as you listen to live music and chat with friendly locals. 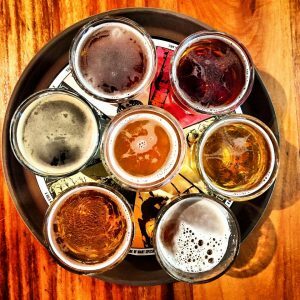 There are five other craft breweries in Golden…and just down the block is the world’s largest brewery – Coors. Rope up and Tackle 300 Different Climbs. Earth Treks Golden is the premier indoor rock climbing and bouldering gym in Colorado offering 300 roped routes and 100 bouldering challenges with many designed by rock climbing legend Jason Kehl. There are classes, training areas and hydraulic system boards. Ride a Steam Locomotive. 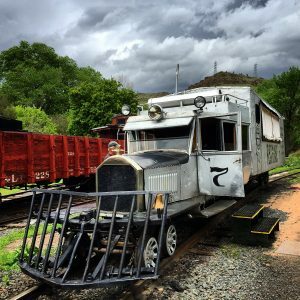 It was the railroads that developed Colorado, and Golden has one of the state’s four operating steam railroads. Passengers travel on a half mile circle around the Colorado Railroad Museum – the state’s largest collection of real and model trains. Wait until you hear the steam whistle echo off the surrounding buttes. Climb a Beauty of a Butte. Golden is surrounded by two volcanic buttes that were formed 65 million years ago – North and South Table Mountains. Dinosaurs once roamed here. The first T-Rex was discovered on South Table Mountain and you can still see dinosaur tracks. Both buttes have easy hiking trails and spectacular views of Golden and the snowcapped Rocky Mountains. Eat Your Heart Out. No getaway is complete without a delicious meal. And from top rated pizzas at Woody’s, to a farm to table feast at Abejas, Golden offers a wide selection of choices. On sunny days, sit outside and watch the kayakers go by from the patio of Bridgewater Grill. See Mount Everest, then Eat Like a Sherpa. 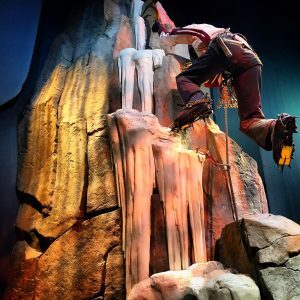 The Bradford Washburn American Mountaineering Museum is the only museum in the nation dedicated to the heroism, technology and spirt of mountaineering. See the clothes worn by the first Americans to summit Mount Everest and learn practical tips on how to climb a Colorado 14er. Hungry? The Sherpa House Restaurant and Cultural Center down the street has authentic Himalayan cuisine such as Yak Stew and Chicken Daal Bhax, as well as exhibits about the Sherpas – the born mountaineers of Nepal. Meet Buffalo Bill. The Wild West’s most famous scout and showman was buried on top of Lookout Mountain 100 years ago today, and a museum honoring his exciting life has been attracting visitors ever since. The view from the deck has been called the greatest in Colorado, featuring the plains in one direction, and the snowcapped Rockies in the other. Learn about the Treasure Beneath Your Feet. The free Geology Museum in the Colorado School of Mines has 60,000 rocks, gems and precious minerals – everything from moon rocks to Colorado gold. Murals and interactive exhibits help explain the fascinating geologic history of the area, while an outdoor trail leads to dinosaur prints. Want to try your own luck? The museum gift shop can outfit you with a gold pan and instructions.